The Dolly Parton’s Dixie Stampede Dinner and Show in Branson is a great entertainment venue where you can enjoy a wild wild west dining experience with great food while watching old western activities. Dixie Stampede is one of the most entertaining places in Branson where you can watch a variety of cowboy shows with a delightful four-course meal in a cool summer night. The Dixie Stampede Show is a childhood dream come true of Dolly Parton that became a favorite place to dine and enjoy the show. The captivating performances at Dixie Stampede are something unique for all guests where north and south competes in the contests. The Dixie Stampede in a 35,000 square foot theater in Branson features dramatic lights and sounds, dazzling pyrotechnics, and a variety of live animals. 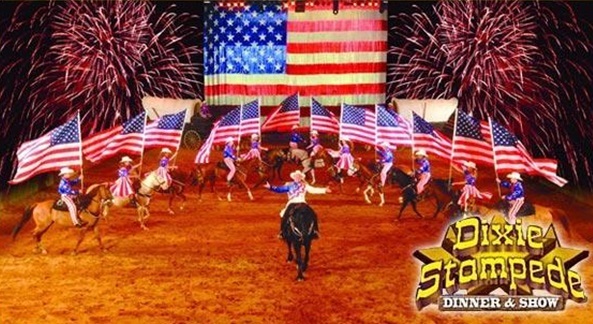 Dixie Stampede Dinner & Show starts with many exciting pre-shows of great performers that include magicians, jugglers, and many other entertainers that will give you a full hour of complete fun and excitement before the main show. In this unique show, you will see great combination of special effects and unique musical productions creating one-of-a-kind entertainment that you will never forget. The four-course meal that you can enjoy in the show is served right in your seat while you are entertained by great performers in the show. The sumptuous food that is served in Dixie Stampede includes a whole rotisserie chicken, barbecued pork loin, corn on the cob, vegetable soup, a herb basted potato, a home-made biscuit, and a delightful dessert. Vegetarian meals are available on request which include vegetable soup, a herb basted potato, garden vegetable salad, corn on the cob, a home-made biscuit, and delicious dessert. In addition to entertaining show and delicious dinner, your Dixie Stampede ticket will give you access to the Carriage Room pre-show where you can have the chance to walk through the stable to see Paint, Palomino, Quarter Horse, and Appaloosa horse breeds. Once you are inside the room, you will be guided by beautiful Dixie Stampede belles to a place where you can enjoy the fun and comedy of Mountain Rukus. There will be availability of soft drinks and peanuts in the Carriage Room that you can enjoy before the start of the main show. Non-alcoholic drinks are also available in the room which are served in souvenir boot mugs. Every guest at the Dixie Stampede Show will never forget the many entertaining shows of great performers and artists where they are sure to give fun and excitement every bit of time. Their unique form of entertainment, from amazing stunt of riders to live horse races, these are the things not to be missed at Dixie Stampede. The final performance of the show will feature illustrious costumes and dazzling lights along with the playing of American songs written by Dolly Parton. The Dolly Parton’s Dixie Stampede in Branson is a great entertainment show where you will get to see old western activities with a delightful dinner in a cool summer night.